With this being a casual deck, we're not looking to spend 44 tickets on what is probably the best out of this lineup. A staple in Bant exalted, Battlegrace offers a solid 5/5 flying, lifelinky attacker with the potential to make our other creatures more effective. 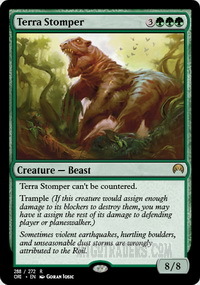 This 5-mana beast is an impotent attacker and a severely late blocker. A quick, otherwise featureless vamp. Mythic with vigilance and lifelink, but a bit pricey. 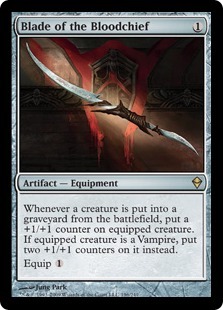 I love this card, but we're not going to be running enough artifacts to make it worthwhile. 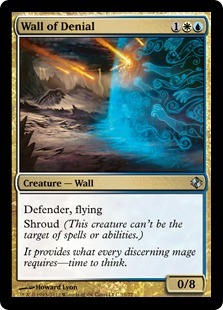 A favorite of the planeswalker control, this wall is a beast in the early game. This guy is a great 2-drop who is likely going to do more defending than attacking. Excellent at dissuading aggro. 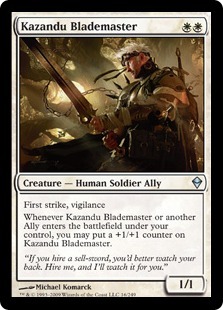 It combos well with the Bond, but its targetability and lower toughness may not let it make the cut. I wound up with a little more white than I was anticipating, but this is going to be rounded off by the rest of our spells. The mana base for Esper is fairly well-developed in Standard, so I wasn't too worried about dealing with land issues at the end of construction. As is hinted at above, our creatures are certainly the most straight-forward way of having our way with our opponent, but there are plenty of life-gaining shenanigans to be had with other spells in Standard. A cheap play for a card advantage, this is a staple in many casual control decks. This can be useful late-game when we've started to play out our hand a little more, or, in a pinch, can be used as an emergency expensive Divination. A favorite of mine, Ponder lets you get trash out of your way or line-up a killer set of draws. The black Tutor is a sweet card-finding trick. 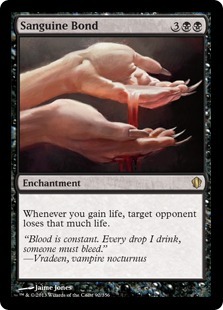 Normally a sideboard card, the Mark here will be instrumental in hosing red (and some black, e.g., Tendrils of Corruption) removal against our stronger lifelinkers. With his life-gain and global-counter abilities, this guy is a super addition if he's not too pricey. The creature list goes largely unmodified (for now) and my spells list looks strong, except for the noticeable lack of any and all forms of removal. My land situation is fairly solid; I would prefer to have some fetch lands like Marsh Flats or more M10 duals such as Glacial Fortress and Drowned Catacomb over the Terramorphic Expanses, but my collection was my limiting factor, and I rarely, if ever, experienced insurmountable mana troubles. Unfortunately, my MTGO logs of this game were lost, so I am unable to recount the exact process of the game. My opponent started with a Kazandu Blademaster; Soul Warden and Ondu Cleric; and Makindi Shieldmate on turns 2, 3, and 4, respectively. I countered with a Deft Duelist and Wall of Denial early, leaving us at an early and, for me, beneficial deadlock. He was slightly mana-screwed, having to discard a Felidar Sovereign before finding a Whispersilk Cloak and attaching it to his now-5/5 Blademaster. His life gain from Ondu Cleric comes back to hurt with a few (Needlebite Traps) and I eventually play out a Battlegrace Angel and Sanguine Bond. He now had an unblockable 8/8 Blademaster attacking, but there was little he could do to stop the Battlegrace Angel from doing 10 damage per turn. Soon thereafter, I dropped a second Sanguine Bond, swung in for 15, and dropped a Tainted Sigil, to which my opponent conceded. This is a great matchup for my deck, and I was extremely lucky to face it first. I had no real mana issues and my delaying tactics worked just long enough to get the big guns out. The obvious flaw of a lack of a way to deal with a white 8/8 vigilance, first-strike attacker caused me to redesign the deck slightly, putting in two (Doom Blade)s, and taking out one Battlegrace Angel and a Tainted Sigil. I'm on the play and keep a sketchy two-lander. I've always been an aggressive player and, I feel, this will be the downfall of me when playing a control deck. I drop an Arcane Sanctum and pass the turn. My opponent drops a Forest and gives it back. My draw is a Deft Duelist, which limits me to dropping a second Sanctum and passing. My opponent terramorphics for a Mountain and passes. I draw a Swamp, which leaves me able to play my Vampire Nighthawk, Deft Duelist, or Mark of Asylum. As he has no creatures out, I'm in no rush to play out my Duelist and drop the Mark of Asylum to shield the next-turn Vampire Nighthawk. My opponent drops a Swamp and passes. I draw a second Mark of Asylum, but play the Vampire out. My opponent end-of-turns Harrow, netting himself another Swamp. He Demolishes one of my Arcane Sanctums and drops a Jungle Shrine. In tough shape, land-wise, I draw a Terramorphic Expanse, which I crack for a Plains. I swing with the Nighthawk. 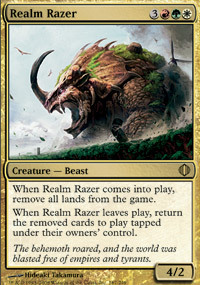 My opponent drops a big Realm Razer and makes my land predicament worse. He and I exchange blows for a turn while he cracks a Terramorphic Expanse into a Mountain. I manage to draw an Island, but at the end of my turn he Lightning Bolts his own Realm Razer to put all lands back in play. My opponent drops another land and plays Ajani Vengeant, immediately tapping down my one attacker. 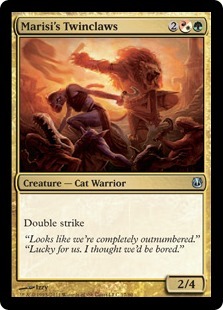 On my turn, I drop a Deft Duelist to deal with Ajani, but he counters with a Marisi's Twinclaws. Thankfully, I've added the two (Doom Blade)s by this point, but I'm afraid I'm going to have to Diabolic Tutor for one of them. I mercifully draw an island and Divination into a Swamp and a (Doom Blade), with which I destroy the Twinclaws. This lets me swing in for 2 against Ajani Vengeant with the Duelist, dropping him to 3 counters. At this point, the game is at 12 life to 20 in my favor. My opponent plays out a second Marisi's Twinclaws, drops a Swamp, taps down my Nighthawk, and passes the turn. I drop my Swamp, tutor for the 2nd (Doom Blade), kill the Twinclaws, and again swing in for 2, dropping Ajani down to 2 counters. At the end of my turn, my opponent Naya Charms for his (Marisi's Tiwnclaws). During his turn, he plays the Twinclaws, taps down the Nighthawk, and passes. I draw a Plains, drop a second Deft Duelist, and Mind Spring for 3. I pick up a Swamp, Divination, and Ponder, and pass the turn. My opponent is inactive, tapping down the Nighthawk and passing. My Divination turns up an Ajani Goldmane and Felidar Sovereign. I drop Ajani, killing them both, and pass the turn. Unfortunately, my opponent has a second Ajani Vengeant in hand, plays him out, taps down the Nighthawk, and passes. I draw a Battlegrace Angel, drop a Terramorphic Expanse, cracking it for another Swamp, and play out the Felidar Sovereign. My opponent taps down the Nighthawk, Terminates the Sovereign, and passes. 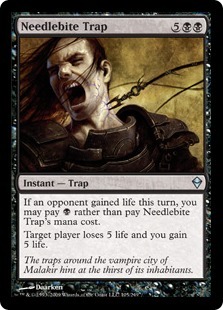 I draw an unhelpful Needlebite Trap, play my Arcane Sanctum, and drop Battlegrace Angel, passing the turn. My opponent plays out a second Realm Razer on a tough board position for him, taps down the nighthawk, and passes. This puts Ajani Vengeant at a dangerous 6 counters and out of killing range for my Battlegrace Angel. Nevertheless, I swing in for 5 against Ajani Vengeant with the Angel. My opponent taps down the angel and passes the turn. Things are not looking good as my Vampire Nighthawk is finally able to untap and my opponent concedes. While this isn't exactly how I want to win games, I was happy with the way this one played out. The Deft Duelists were clutch and the tapping down of the Vampire Nighthawk highlighted how useful having more than one of him in this deck would be. The Felidar Sovereign is weak against popular black removal, such as Terminate and Doom Blade, and, I think, the deck would be better served by replacing him with a meaner, more evasive beastie like the Sphinx of the Steel Wind. My card advantage in this duel was the key to my success, but I think I may need more easily-accessible removal. I start on the play and drop a Swamp, hoping for the first-turn Needlebite Trap. My opponent, however, is not in a generous mood and instead plays a Forest and drops a Llanowar Elves. My hopes dashed, I drop an Arcane Sanctum and pass the turn. My opponent drops a forest and Rampant Growths into a 3rd Forest. Confoundingly, he does not attack with the Elves. This is a decision that will come back to haunt him. I drop an Island, but have no Duelist or Wall to play, so I pass. I am beginning to realize that my hand was probably not a wonderful keep, despite the Diabolic Tutor, Diabolic Tutor, and Battlegrace Angel. 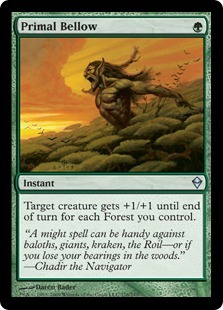 He drops a Forest and plays a turn-5 Gigantiform on his Llanowar Elves and passes the turn. I drop an Island and Diabolic Tutor for a Doom Blade, noting to myself that this was one creature that even the Wall of Denial would struggle against. This allows my opponent to drop another forest, play Deadly Recluse, swing in with the 8/8, and cast Primal Bellow on it, dropping me to 7 with one swing. Doom Blade in hand, I drop a Plains and pass. My opponent drops a sixth forest, thus ensuring my loss if he has a second Primal Bellow and swings with both creatures. I wait on casting Doom Blade until the last second and my opponent guesses I have conceded. He plays Vines of Vastwood, bewilderingly unkicked, onto his Deadly Recluse. 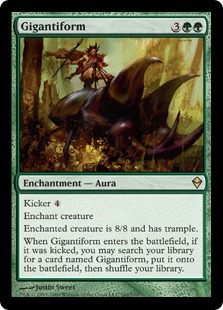 In response, I kill the Gigantiformed Llanowar Elves and drop to a lucky 6. I drop and crack a Terramorphic Expanse after drawing my second Doom Blade. I have two Mind Springs in hand, so I draw one for three and leave two mana open for the Blade. My opponent drops a second Llanowar Elves and swings with the Deadly Recluse. As no pump is forthcoming, I sit on the (Doom Blade), and draw and play out a Wall of Denial. The Deadly Recluse swings again and, as I'm unwilling to lose my Wall, I (Doom Blade) the spider. He drops a Borderland Ranger and passes the turn. Finally feeling in control, I drop my Battlegrace Angel and pass the turn. My opponent drops a forest, plays Rampant Growth, and passes the turn. 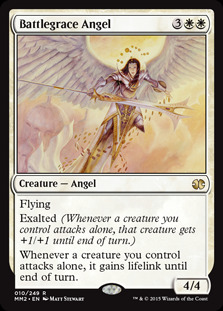 I play out my Sanguine Bond and swing with the Battlegrace Angel, but he Naturalizes my Bond before damage is dealt. My opponent evidently topdecks another Primal Bellow and swings with the Elves and the Ranger. I block the Borderland Ranger with the Wall of Denial. The bellow on the Elves would have dropped me to 1 (and I'm sure he was then kicking himself for his earlier missed opportunity), but he instead chooses to kill the Wall. I cast a second Sanguine Bond and swing in with Battlegrace Angel, putting him at 5 and myself at 14. My opponent draws a Forest, swings in for 3, and passes. I cast Needlebite Trap and win. This was a game I clearly should not have won and equally clearly that my deck should do well against. I kept a decent hand, but one with 0 answers to early threats. I was lucky to find a few through drawing, but I felt that I would normally cream this deck. This game was essentially a race with both decks playing out in an obvious fashion. I dropped a turn-2 Deft Duelist after mulling to 6 and my opponent dropped two Memory Erosions on turns 3 and 4. Turn 5 I played out Battlegrace Angel and turn 6 I Diabolic Tutored for Sanguine Bond. On turn 7, I dropped the Bond and the real race began. My opponent Mind Funeraled me 3 times and by the time I was able to swing in for lethal, I had 10 cards in my library. This is a terrible matchup for my deck, as there's little to no accelerating. However, the sheer amount of damage possible through the Angel/Bond combo was able to race me to victory in two turns. My starting hand was good and I received two clutch land draws, but I can't see myself coming out on top in this matchup too often. I'm on the play with a great defensive hand, and on turn 2 I drop out a Deft Duelist. 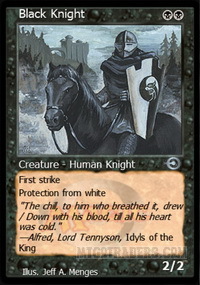 My opponent counters with what will amount to be the bane of my existence, Black Knight. 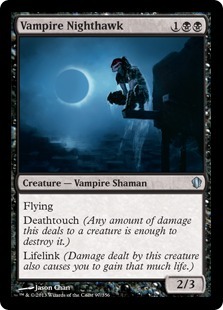 Black Knight will hose my entire deck, as it dodges the majority of my creatures, including Deft Duelist and the Wall of Denial, and cannot be killed by my single removal, (Doom Blade). My opponent ends up dropping another, along with a few ineffective vampires, and pumps a Knight one with an Unholy Strength. He beats me down for the win before I can begin any life gain. This was a demoralizing loss after my great start, but made me think about replacing some cards with the extremely synergistic Tendrils of Corruption. When this deck was a mono-black control deck in my mind, before factoring in the benefit of adding white and blue, Tendrils was at the top of my list, but didn't make the cut due to the max of 5 Swamps I can draw with our current version. I'm still unconvinced that it should be in here, but it's something to think about when playing against mono black decks. My opponent began with several Exalted soldiers, swinging in with a turn two 4/3 Elite Vanguard pumped by double Akrasan Squires. I eventually put up a Wall of Denial and began taking two per turn. I was able to delay by playing out more Walls and an Ajani Goldmane to pump them and cut down on the soldiers' numbers, but a Veteran Swordsmith and a Brave the Elements put me out of my misery. I got pretty badly swarmed this game, showing that early defense against big beasties wasn't enough to deal with overwhelming weenies. While putting in a few slightly more offensive Wall of Reverences would help, really what I needed was a wrath effect like Infest to deal with the attackers. I really wanted to avoid all mana issues, so I dropped in two more lands. Needlebite Trap had really done nothing in any of the test games, so, despite my initial fascination, I cut all of them out. I didn't think Ponder had been all that great, so I went instead with a couple Sign in Bloods, which gave me a cheaper (and different) Divination to play around with. Infest became my wrath effect. A friend gifted me a second Vampire Nighthawk, so I slipped him in as well. My opponent started off a little mana screwed, but oneExpedition Map and two (Khalini Heart Expedition)s later, he was well on his way to meeting his mana requirements. 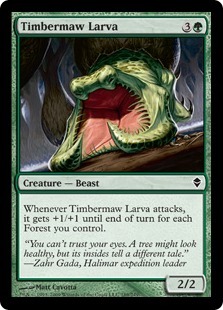 I had dropped a Vampire Nighthawk turn three and drawn into good spells with a fine mana base, though, so by the time he dropped his first Timbermaw Larva, I was ready with an Infest. Sanguine Bond hit the board and he put down a second Larva and a Terra Stomper. I had dropped a Wall of Denial the turn before, though, and I followed that up with a Felidar Sovereign and a Deft Duelist. He swung in with both creatures; the Duelist died to the 11/11 Larva and the Sovereign to the Stomper. Pumping the Terra Stomper with Primal Bellow put me down to 23, but the Sovereign also hit him for 4 via the Bond, dropping him to 3. The Nighthawk finished him the next turn. The one turn of mana screw my opponent experienced made a large difference in this game (and really pointed to the one major drawback of the land-finding Expedition). My removal for the first larva was clutch, but it is really this kind of deck that my deck is best suited to play. My opponent begins with a Vampire Lacerator and a turn two Blood Seeker and i drop a Deft Duelist in response. He plays a Blade of the Bloodchief and equips his Blood Seeker and a Bloodchief Ascension. I already sense trouble, so I block the Lacerator, pumping the Seeker. I drop a Battlegrace Angel, but it meets a Hideous End and the Seeker is getting too large to deal with. He drops a Bloodghast and swings with the Seeker. I draw a blank Doom Blade, drop a second Battlegrace, and promptly watch it die to a second End. With low life and no answers in hand, I concede. Blanking out half of my removal is never going to end well for me and the quick answers to Battlegrace Angel were real trouble. I'm happy with the way this deck turned out, but it could obviously stand to be improved. For someone who doesn't play a lot of control, this was a really fun deck to play around with. 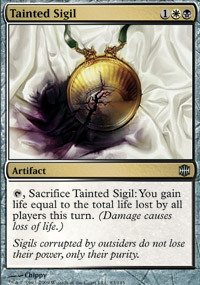 The amount of damage through unsuspected sources like the Tainted Sigil is really attractive to me, and turning life gain into a useful mechanic outside of just increasing your own total is fun. My deck can definitely be much better, and I hope anyone who reads this will experiment with other cards. I wound up building a white/black version of the above deck, taking out early blockers in favor of more removal like Infest, Disfigure, and Tendrils of Corruption. 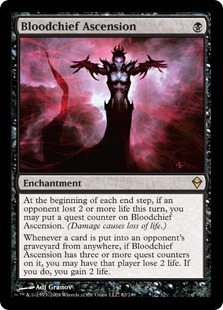 In addition to this removal, I put in four (Necromancer's Covenenant)s, which works well with Sanguine Bond. This, too, added a little to the land count. None of the cards in my decklist outside of the one-fers Glacial Fortress, Ajani Goldmane, and Felidar Sovereign sell for more than a ticket each. And while all of these are extremely useful, only Ajani is the one that I would say is the one that I wouldn't bear to cut. This is a cute novelty deck that's cheap to put together and fun to play with. Enjoy!